Hello folks, I hope you have had a satisfying week and are ready for some fun this weekend. A piece of great news - Caprilicious Jewellery is soon to be available at an outlet in Abu Dhabi - I have sent off the first consignment, and if the jewellery sells well there, I might do regular business. More about this next week. I had to share this - I sold this pendant last week to a lady who asked me what inspired me to make it - she was obviously well into Art Nouveau jewellery - she had written a thesis on the subject, and she said the pendant reminded her of Lucas von Cranach's Tintenfisch und Schmetterling - I had actually seen the aforementioned pendant on a website during one of my periodic browses of the internet - but to be compared with a master jeweller - very humbling. Who knows what stays in your brain when you look at images constantly, as I do - or, if this pendant was indeed influenced by Lucas von Cranach - all I can say is, I see the octopus, but not necessarily the butterfly - I leave you to decide whether they do actually have some resemblance to one another. Tintenfisch und Schmetterling (Octopus and Butterfly; 1900) by Wilhelm Lucas von Cranach, a master jeweller who liked his octopuses - strange bedfellows, I say! I went to Shrewsbury this week, to the workshop of the lovely Jules Harper to learn how to prepare precious metal clay pieces for the application of enamel. I went on an enamelling and a precious metal clay (silver) course last year at In The Studio, but this time around, wanted one on one tuition. Now that I have a bit of experience, there were so many questions bothering me - one cannot keep bobbing up and down in a class with loads of people - you sound like a smart aleck and eat into other peoples time. Jules taught me how to fire copper and bronze clay properly, and to prepare them and enamel them - most exciting of all, the little lentil bead I made with copper clay and enamelled on both sides - it would look so sweet in earring designs, and is light because it is completely hollow. She is a very patient teacher, and the time just flew by - that's a sure sign of a lot of fun - maybe not quite so much for her, though. I thought it was around 5pm when I left her place, and it was only when I was halfway home, I realised it was in fact well past 7pm - sorry Jules! Now that the weather is slowly getting better, I want to play with my kiln and make some colourful pieces in it, and thanks to Jules now, it wont be such an anxiety ridden operation. Having 'borrowed' the necklace on the right in reds and golds, to wear to a dinner party, I received so many compliments that I felt i needed to make another, this time in the cool colours of blue and silver - to my eye, it looks like the necklace has been bathed in moonlight - but, I will leave it to you to decide if the name is apt, and which one you prefer. The Greek word "amethystos" may be translated as "not drunken", from Greek a-, "not" + methustos, "intoxicated". Amethyst was considered to be a strong antidote against drunkenness, which is why wine goblets were often carved from it. According to a 16th century French poem, Dionysus, the god of intoxication, of wine and grapes was pursuing a maiden named Amethystos, who refused his affections. Amethystos prayed to the gods to remain chaste, a prayer which the goddess Artemis answered, transforming her into a white stone. Humbled by Amethystos's desire to remain chaste, Dionysus poured wine over the stone as an offering, dyeing the crystals purple. Amethyst is a purple quartz found deep within volcanic rock, and its colour comes from manganese and iron impurities. The Agapanthus or Nile lily is an amethyst coloured flower, and the little nuggets of amethyst in this next necklace brought the buds of this very pretty flower to mind. I had a load of these in my garden, but unfortunately, as the name suggests, it likes warmer climates and all of my plants died. I might try to grow it indoors this year. I love the geodes/ druzy form of any gemstone, where the natural striations are left in, as part of the stone, and the pendant I used was sourced with great difficulty. It came to me all the way from Brazil, after a lot of bargaining with the vendor, to secure the best price. I thought it was so regal, I crowned it with a scroll of wire filigree work. A little jade butterfly, prehnite nuggets and some green crystals set the purple of the amethyst nuggets off beautifully. That's all I had time for this week folks. 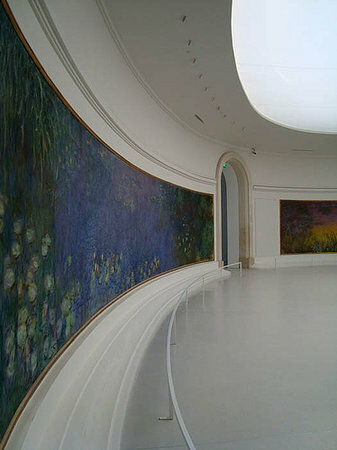 We are off to Giverny, and will visit Monet's garden, and then on to Paris where I want to see his paintings at the Musee de l'Orangerie.